The pumpkin in this recipe is a good example of how I like to use healthful ingredients whenever I can to pump up the nutritional value of sweets. Pumpkin is considered a "superfood" by many nutrition experts, as it is packed with antioxidant carotenoids that have been shown to prevent some kinds of cancer. Muscovado sugar makes a thick, dark syrup rivaled only by maple syrup in richness and taste. Use either light or dark sugar, depending on whether you prefer a mild or robust flavor. The muscovado is the perfect match for the slightly savory notes in these pumpkin waffles. Be sure to use the syrup the same day as it is made, as it will recrystallize if held longer. The pumpkin in this recipe is a good example of how I like to use healthful ingredients whenever I can to pump up the nutritional value of sweets. Pumpkin is considered a "superfood" by many nutritional experts, as it is packed with antioxidant carotenoids that have been shown to prevent some kinds of cancer. Muscovado sugar makes a thick, dark syrup rivaled only by maple syrup in richness and taste. Use either light or dark sugar, depending on whether you prefer a mild or robust flavor. The muscovado is the perfect match for the slightly savory notes in these pumpkin waffles. Be sure to use the syrup the same day as it is made, as it will recrystallize if held longer. To make the syrup, bring the muscovado sugar and ½ cup of water to a boil in a medium-size saucepan over medium heat, stirring to dissolve the sugar. Stop stirring and lower the heat to low. Simmer for 3 minutes. Keep warm. To make the pancakes, whisk together the flour, baking powder, and salt in a medium-size bowl, and make a well in the center. Whisk together the pumpkin, milk, egg yolks, muscovado sugar, melted butter, and orange zest. Pour into the well in the dry ingredients, and stir just until combined. To make the waffles, whisk together the flour, baking powder, and salt in a medium-size bowl, and make a well in the center. Whisk together the pumpkin, milk, egg yolks, muscovado sugar, melted butter, and orange zest. Pour into the well in the dry ingredients, and stir just until combined. In a separate bowl, beat the egg whites with an electric mixer on high speed until they form soft peaks. Stir one-fourth of the whites into the pumpkin batter to lighten it, then fold in the remaining whites. 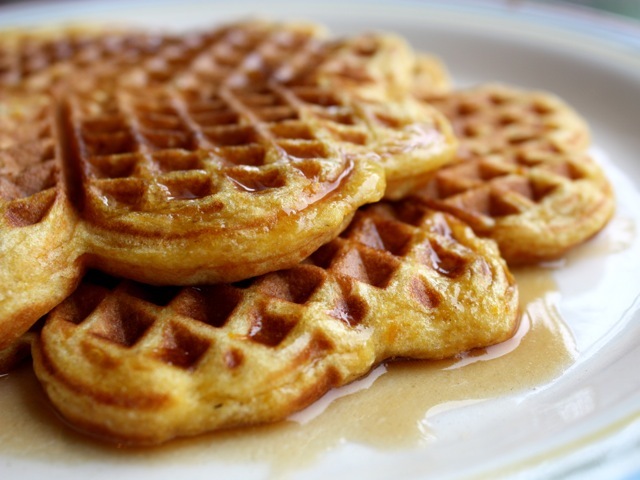 Bake in a waffle iron according to the manufacturer's instructions. Remove from the iron and serve hot, with the syrup and butter passed on the side.